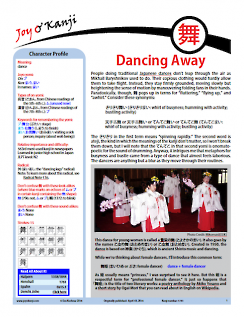 Traditional Japanese dance may seem tangential to your life, but it has connections to the gods, so don't overlook it! Also, 舞 is a core part of Nihongo, factoring into terms for bustling activity, story settings, being in the limelight, behaving well or badly, treating others to meals, visiting the sick, seasonal greeting cards, and closing up shop, as well as the words for kabuki and butoh. June 29, 2017: pp. 2, 8, and 20: Fixed or eliminated broken links. May 22, 2015: On p. 23, a photo caption about a sign with お見舞いを申し上げます (おみまいをもうしあげます: you have our deepest sympathy) now reflects that this phrase includes を. • pp. 14 and 16: I had "-年 (-ねん: counter for years)" in vocabulary lists. Both should have been 年 (ねん: year). • p. 20: In the photo caption about the Gauguin sign, 弱 should have been 溺.
April 18, 2014: Originally published.